The Val d’Orcia area is a wide valley near the border between Tuscany and Umbria which extends, in large part, in the province of Siena, and a small part, in the province of Grosseto. Crossed by the Orcia river, which gives its name, it is characterized by pleasant landscape views with rows of cypresses. For the beauty, history and nature was established Natural Artistic Park of Val d’Orcia, considered World Heritage Site by Unesco. The dominant feature of the landscape consists of erosion, which, where they are more pronounced, lay bare the underlying clay layer of light color. The most striking and peculiar forms of erosion are represented by gullies visible in the areas of Casa a Tuoma (Pienza), Ripalta (San Quirico d’Orcia), Lucciolabella, Torre Tarugi (Pienza), Contignano (Radicofani). The ancient Via Francigena, the medieval pilgrimage route to Rome, passing through the area, for centuries allowed the small towns to grow, without ever surrendering totally to progress. These small towns that retain traces of the historical past, today that welcome tourists as they once did with the pilgrims. In fact, the current landscape is not much different from the one that fascinated the great painters of the Middle Ages or the Renaissance, the English, French and German writers of the 19th century. 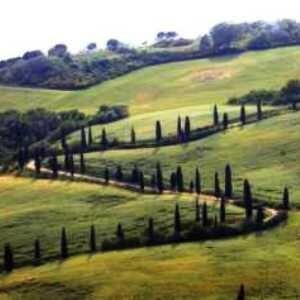 Currently the Val d’Orcia area is a popular tourist destination and receives thousands of tourists every year. 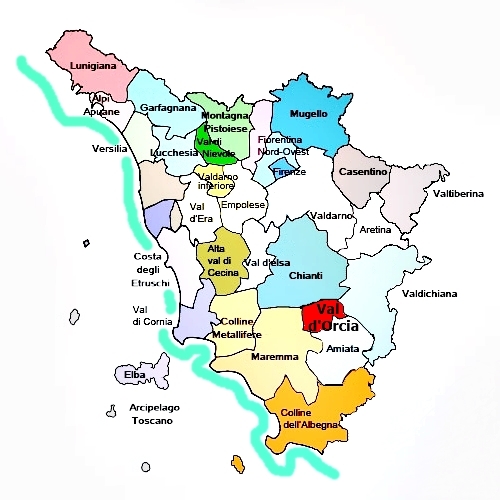 Of note is the location of Bagni San Filippo (Castiglione d’Orcia municipality) and Bagno Vignoni (San Quirico d’Orcia municipality) for the presence of thermal waters with therapeutic properties, primarily the treatment of skin diseases, rheumatic and arthritic, known since ancient times. It is a small village with medieval features, immersed in a typical Tuscan landscape, located in the Natural Artistic Park of Val d’Orcia. The name comes from the thermal source and from Vignoni, famous castle in the 11th century, whose ruins dominate the village. 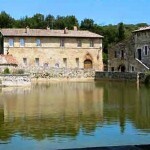 The town is known for its thermal baths, known since the Etruscan and Roman eras, and the many outbuildings spas. The baths were frequented by famous people such as Saint Catherine of Siena, Lorenzo Medici, known as “The Magnificent” and others. 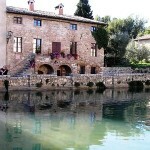 Despite numerous incidents of war, the appearance of Bagno Vignoni has remained largely unchanged. To see Parchi dei Mulini and Piazza delle Sorgenti. The territory is located in the center of Val d’Orcia and is mostly mountainous and hilly. 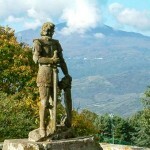 The main village is spread over a hill which is part of the northern foothills of Mount Amiata. The clay geological formations, known as “crete” or “badlands,” they contrast with the green of forests. The area is part of the Artistic Cultural Val d’Orcia, ranked by UNESCO World Heritage Site in 2004. The town is situated on top of a hill which offers excellent views of the surrounding valleys. The town’s name derives from the Latin mons Ilcinus, referring to the big extension of oak woods in the area. 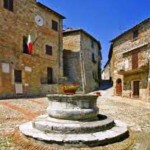 Montalcino still keeps intact the medieval appearance of defensive origin, crossed by narrow streets. From medieval times remain the walls that still keep the doors and part of the towers. The territory, which is part of the Artistic, Natural and Cultural Park of Val d’Orcia, is full of vineyards that produces wines of high quality as the famous Brunello. The town is also known for its qualified production of honey, extra virgin olive oil, cured meats and cheeses. 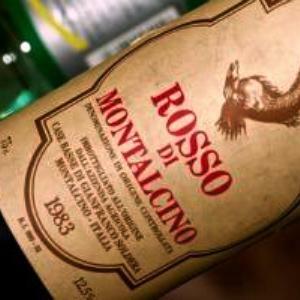 In 2004 Montalcino and Val d’Orcia have been awarded “World Heritage”. 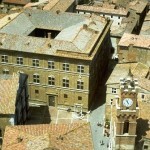 To note the ‘ Sant’Antimo Abbey , the Glass Museum and the Museum of Brunello. The history of the town is closely linked to that of Enea Silvio Piccolomini, born in the village and later became Pope Pius 2th. 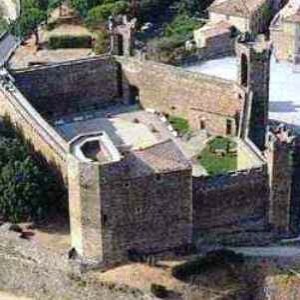 The pope wanted to transform the small medieval village called Corsignano Castle in the papal residence. The project was entrusted to Bernardo Gambarelli, called Rossellino. There are many palaces from 15th century located along the main street and the beautiful Cathedral. Pienza is the center of major artistic importance of the Val d’Orcia area. In 1996 the historic center was declared a World Heritage by UNESCO. Equally picturesque is The Gozzant district, the oldest part of the town, characterized by small houses located on the sandstone cliff and overlooking the velley of Orcia river. 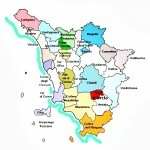 The area is also known for the production of excellent cheeses, first of all the “pecorino”. Radicofani is located at the foot of a cliff of volcanic basalt rock896 meters and it is characterized by the imposing fortress which for centuries dominated the border between Tuscany and Lazio. Inside the village there are numerous marble fountains: the Fonte Grande, the Medici Fountain, the Fountain of the Capuchinsand the Source Antese. San Quirico is an example of the most significant medieval urban structure and preserves, in many buildings, many traces of the importance reached in some moments of its history. It has preserved good part of the walls along which are still as many as 14 towers, although some embedded in other structures. The territory is a spa of ancient orgini and which was frequented by famous people. It is a small spa town that has developed thanks to the sulphurous waters with therapeutic properties have been known since ancient times. 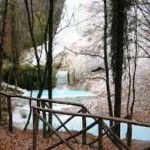 Near the village of Bagno di San Filippo is the so-called White Ditch, where the millennial passage of calcareous water left white concretions in the form of waterfalls and special environments such as the Bollore, a limestone hill. The notoriety of the area dates back to the 13th century when Philip Benizzi, Florentine physician, used the waters of the springs to operate cures considered miraculous that won him the title of saint. Nearby is located the Hotel Terme San Filippo with spa pool, is very suggestive of thewaterfalls in the park setting with the opalescent water and the vapors that arise. There are numerous holiday-care proposals, in particular, relate to wellness, beauty and fitness. At the center of the village of Bagno Vignoni is located the “Piazza delle Sorgenti”, a large rectangular pool, dating from the 15th century, fueled by a hot sulfur spring, slightly radioactive, used for medicinal purposes since Roman times, which It comes out at 51 ° C by an underground aquifer of volcanic origins. In past centuries, the tub, the water was conveyed in the spa and, later, went to feed a series of mills located along the river below. Around the pool they are distributed medieval and Renaissance buildings that now house shops and restaurants. 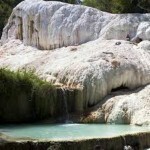 Near, there is the Parco dei Mulini, an outdoor village where you can swim freely in the warm water and sulfur. In the town there is Terme spa of Santa Catarina that takes advantage of the spring waters in the treatment of various inflammatory and degenerative types such as osteoarthritis, rheumatoid arthritis and others. Particularly attractive is the wine and food recall. 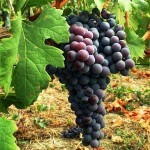 First of all for its superb wines: just to name two Brunello di Montalcino and the new wine DOC Orcia. But also other agricultural and food products have gained a well-deserved reputation as the Pienza Pecorino cheese made from pure sheep milk from local farms. The special aroma of the cheese is due to the presence of a more unique than rare flora pratense: wormwood, salsify, birdsfoot, burnet and juniper. Significant is the reintroduction, in the Val d’Orcia, the cultivation of saffron plant. The territory has spread the breeding of the “Cinta Senese”, a variety of very old pig (15th century). The animals are raised in the wild by excluding strictly controlled tethering, both for the welfare of the beast for the characteristics of the meat. Selected from these pigs are derived mainly hams, shoulders, sausages and bacon; also other typical products of the Tuscan pork products, such finocchiona, brawn, and cheeks. Treno Natura is an initiative that allows you to make an entire day’s journey through the Val d’Orcia in a rather unusual way. 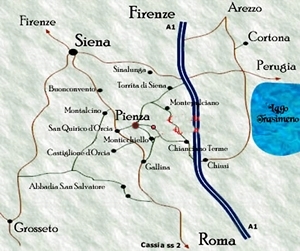 The starting point is Siena and the route crosses, in sequence, the territory of the following municipalities: Siena, Asciano, San Giovanni d’Asso, San Quirico d’Orcia, Castiglione d’Orcia, Abbadia San Salvatore, Piancastagnaio, Buonconvento. 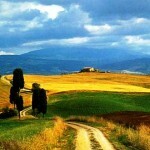 By the end of the 1950s, or by wagons towed by a steam locomotive, you can enjoy the landscape of the Val d’Orcia. 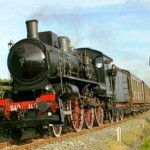 It is also a unique opportunity to travel on historic rail trains using a line now closed to ordinary traffic. It is possible to take excursions on the trails between the various stations set up by CAI-Club Alpino Italiano, take horse carriages, visit the main monuments, dine in typical restaurants, participate in village festivals and recreational activities. The Nature Train is also suitable for those who want to combine travel with activities such as trekking, bicycle tours, museums and tastings. The initiative is always combined with an event or fairs and events in the various municipalities of the province of Siena. The resorts not served by the railway line can be reached by bus at coincidence at the stations. Orcia Wine Route was born in 2003 and has its seat at the foot of the Tentennano Fortress in Castiglione d’Orcia. The element that accompanies the territory on which the Orcia Wine Route is made is the landscape, one of the most characteristic and fascinating of Tuscany. In 2004, UNESCO has included the Val d’Orcia in the World Heritage Site of Humanity, the first rural area to be awarded with this recognition by defining it as “landscaping icon”. Sweaty hills, cypress trees, castles and abbeys, churches and convents, villages and towns, farms and roads form a kind of “layer of history” set on a geography that looks tailor-made. The Etruscans were importing the vine from the far east, and today the descendants are still generating the vine-growers’ art in generation. The Wine Route Orcia, meeting the ever-growing and enthusiastic wine lovers who visit the Val d’Orcia in search of gastronomic excellence and who wish to taste and savor the Vine Orcia DOC with tranquility and expertise, has created a new collaboration Between the Enoteca del Corso (www.enotecadipiazza.com) of San Quirico d’Orcia and the wineries associated with the Orcia Wine Route. 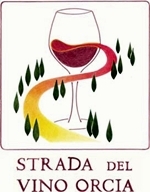 By submitting the complimentary coupon, courtesy of the Tourist Office or the accommodation facility at which you are staying, to the personnel of the Enoteca del Corso di San Quirico d’Orcia, or directly at the wineries associated with the Orcia Wine Route you will have Right to a free wine tasting of Orcia DOC wines. 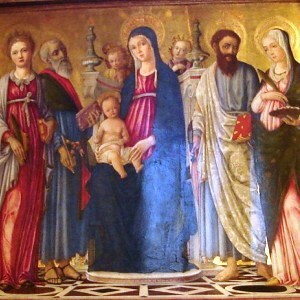 By holding the coupon, those who have made a tasting will be recognized by submitting the same coupon to the ticket office, a 50% discount on the ticket to the museums that collaborate with the Wine Route Orcia: in Castiglione d’Orcia the Sala Art of San Giovanni, in Chianciano Terme the Etruscan Mueso, in San Giovanni d’Asso the Tartufo Museum, in Pienza the Diocesan Museum, in Monticchiello the Museum of the Popular Tuscan Traditional Theater(TePoTraTos). The Val d’Orcia and its impressive corners inspired famous movie directors and artists. Already in 1951, Curzio Malaparte turned into his only movie Forbidden Christ, drawn from his homonymous novel. Director Andrei Tarkovky visited the baths of Bagno Vignoni and turned unforgettable sequences of his masterpiece Nostalghia (1983). Director Franco Zeffirelli chose Bagno Vignoni and Pienza for the Romeo and Juliet movie. Bernardo Bertolucci also decided to set up several scenes of I dancing alone (1996) in a cascinale of the “Crete senesi”. It is in the Benedictine monastery of Sant’Anna in Caprena that the male protagonist of The English Patient, the film by Italian-American director Anthony Minghella, is awarded with nine Oscars. Still in Val d’Orcia, director Ridley Scott has shot many outdoors of The Gladiator.